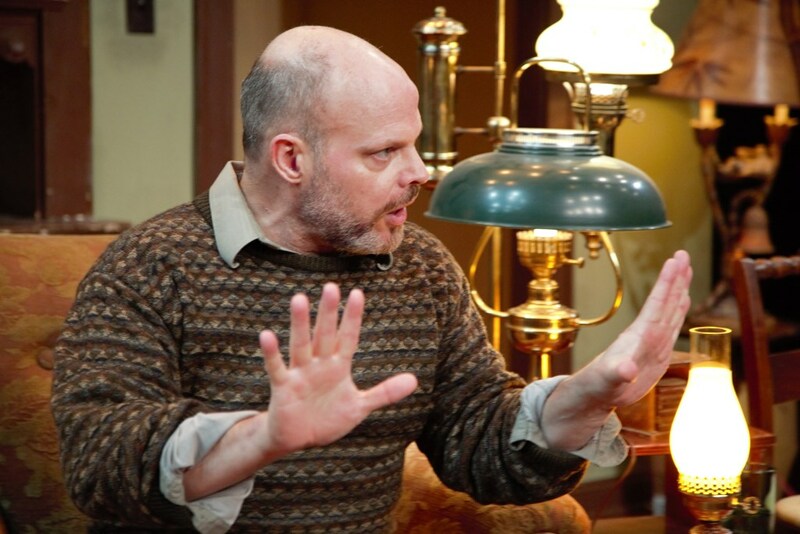 Lamps for My Family: Mark Corkins as Jack Duddy. Photo by Ryan Blomquist. 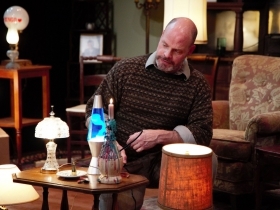 Ghosts in the form of individualized bulbs scattered all over the living room flicker on and off in Lamps for My Family at the In Tandem Theatre through March 13. The leading character, Jack Duddy, operates – or thinks he operates – the switches on the lamps of the departed, only to find them taking over the cavernous Duddy mansion in Milwaukee where he grew up. He returned there as caretaker before the last deaths and continues to remember all his relatives dying off and re-entering his memories, flicker by flicker. Actor Mark Corkins has that sole challenge. 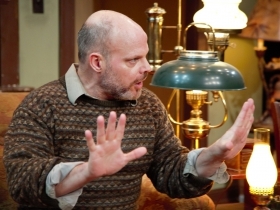 And at this point he’s not quite matching in effectiveness the myriad of powerful one-person performances Milwaukee has enjoyed over the last few seasons, including Marti Gobel in No Child Left Behind and Deborah Staples in the Rep’s Amish Project. Corkins never quite decides how far to go in mimicking voices, ages and genders as the story unfolds – a hesitancy other actors have overcome and he still may. He is relying on his smoothness and warm personality to illuminate in always watchable form some 20-odd members of the Duddy family . . . plus their pets. 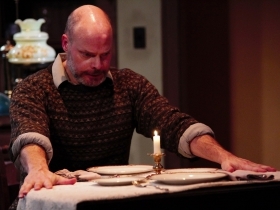 He is seeking in the quiet ways a good actor does to strengthen the main weakness in a deliciously written play – exactly who is Jack Duddy and why, as a vital compassionate psychologist in real life, does he stay with these ghosts and melancholy memories long past the era of their vitality or his? Anyone who knows playwright Michael Neville, and I know him well, realize that cynical jests, lively intricacies of language and anecdotes punched with laughter are ingrained in his view of life, reflected in such works as Ballymurphy and the ten-minute play festivals he has operated. We have mutual friends stemming from his time as my acting student in the 1960s at Marquette University where I forced him to receive a flying body across the stage. He has been accepting life’s flying bodies and lessons ever since and turning them into insights more than blows. He actually was the one-man performer in Lamps about a decade ago, a drama he keeps refining. 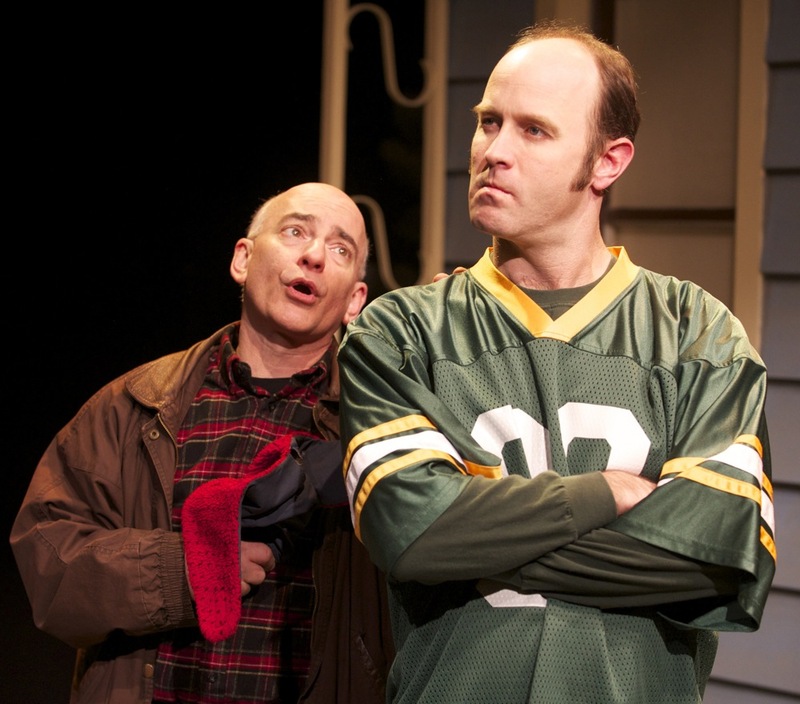 Lamps, loosely autobiographical about growing up in Milwaukee, provides a valuable authenticity and needed alternative to the sort of dancing, George M. Cohan- image of Irish American life that typically sashays the boards to comfort audiences with a leprechaun vision of the emerald isle heritage. Neville prefers the truth and continues to toy with the theatricality of one actor living amid multiple illusions and almost hallucinations about his past. The play is intriguing even where not fully realized in dramatic weight; there is a heft to such honesty about family heritage. There is an often untold, grimly humorous tribal side to growing up Irish Catholic in Milwaukee – school fights, grinding labor at American Motors and International Harvester, alcoholism, physical deformity, illusions of absolutes in faith, devotion to JFK and the Milwaukee Braves, cheap burgers, cheap beer, sumptuous holiday meals and constant fear of the nuns and the confessional. This is the era (1940s through 1960s mainly) that Lamps shines multiple lights on, plus the dilemma of being bound to family members you loathe and love simultaneously. Creating so accurately these successions of relatives through the power of words, the surprises of the stories and the enthusiasm for the language of the times continue to impact the generations who went through it – these were the Milwaukeeans who filled the seats opening night. It will be fascinating to see if a younger theater-going crowd will understand and chuckle as frequently. They are getting a quite accessible production at the Tenth Street Theater, just off Wisconsin Avenue in the back of the red church that is a famous landmark and only blocks away from where Neville went to school. Director Chris Flieller has provided a wonderfully believable set even though over-crowded with individualized reading lamps necessary for dramatic clarity. These lamps are under the control not of ghosts but of clever lighting designer Joey Weldon. Flieller has provided a crisp, intelligent pace and style for the storytelling. Given the confusing parades of generations and Irish brogue and slang involved, it is quite a compliment to Corkins and company that the telling remains so clear and vivid. The difficulty is we are watching and listening in some remoteness – never quite allowed to feel and identify with either Jack or his departed relatives as we might like and respond with the emotion that the climax of mounting terror invites. The playwright and the production remain valuable but the lights of insight should glow with a far greater intensity.